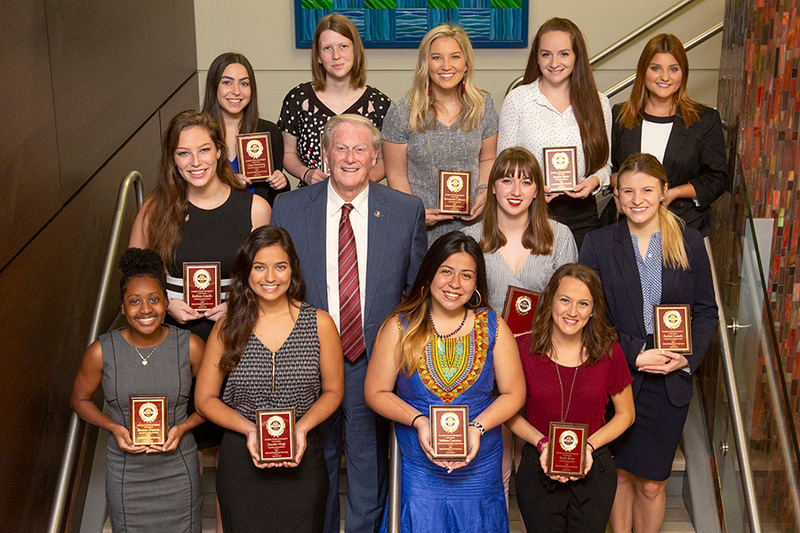 From ratifying amendments to registering bone marrow donors to teaching courses in Kenya and rural India, students at Florida State University have done more than just balance studies and a social life; they’ve changed lives. 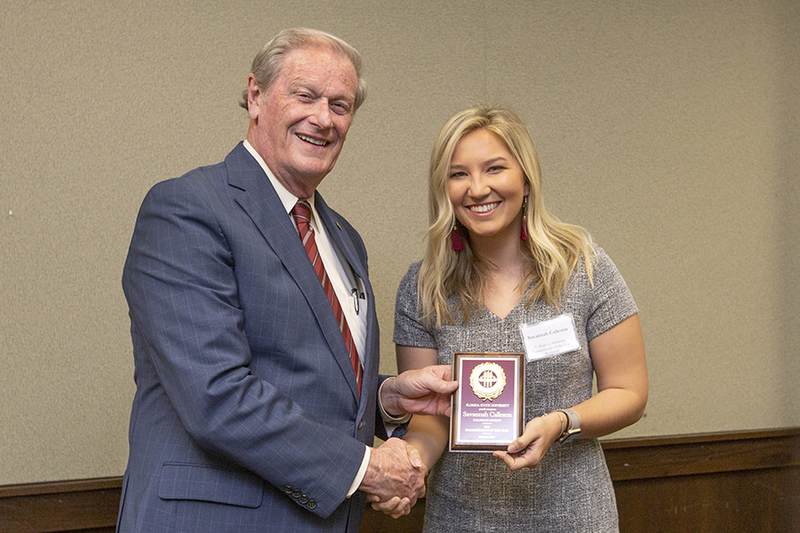 President John Thrasher recognized 14 undergraduate students at the Humanitarian Luncheon Tuesday, March 26, as part of the annual President’s Humanitarian of the Year program. 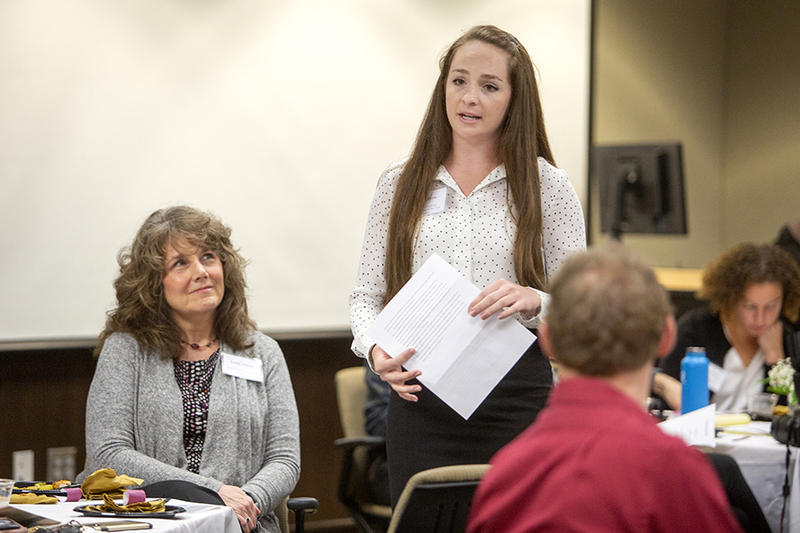 During the luncheon, students shared experiences and reflections from their different service projects. The eclectic group included a filmmaker who recorded nonprofit workers in Uganda, a Bear Management Unit intern and a shift supervisor at a major crisis counseling hotline. 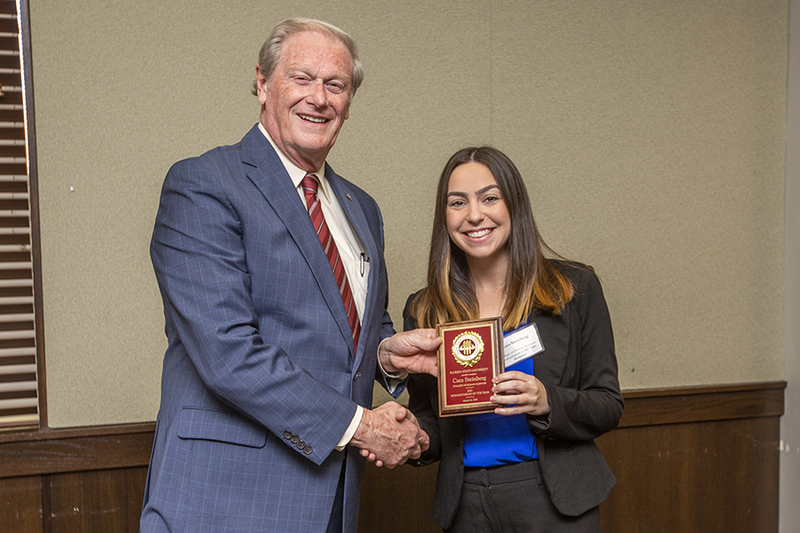 Thrasher applauded each of the students’ philanthropic endeavors. It’s worth noting that this year’s honorees were all women. 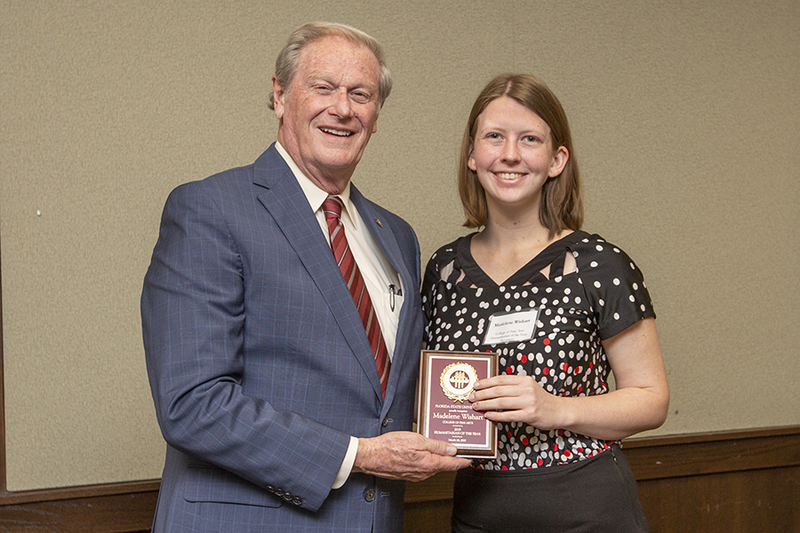 For more than 20 years, FSU has presented a Humanitarian of the Year award, a prestigious honor that commemorates a student who exhibits a tremendous commitment to service. Each college selects one student as their nominee who is recognized at the Humanitarian Luncheon. 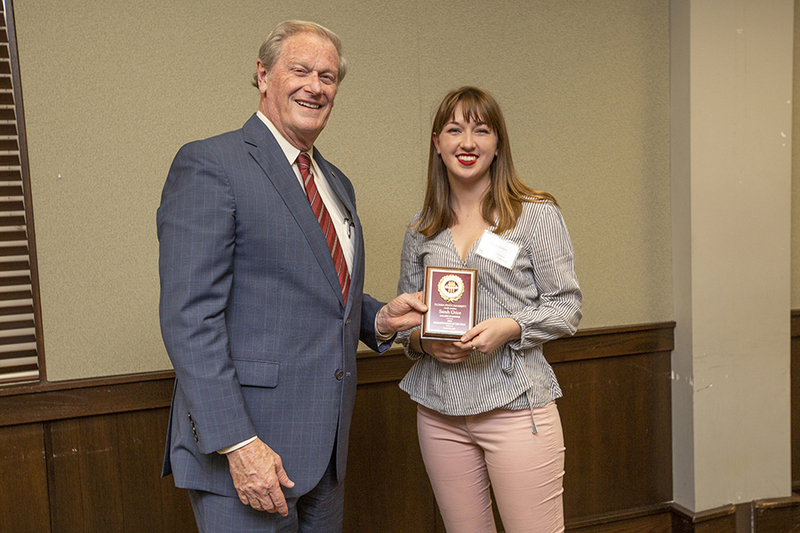 Nominees receive $200 donated in their name to the nonprofit agency of their choice, and the student who best embodies a commitment to service is named the Humanitarian of the Year at the annual Leadership Awards Night. An additional $1,000 is given as a donation to the nonprofit agency of the recipient’s choice. Angela Byrne is the College of Nursing’s nominee. She tutors children at HOPE Community, regularly returns to her hometown of Crystal River to package meals for hungry communities and recently participated in a MEDLIFE service trip to Riobamba, Ecuador. 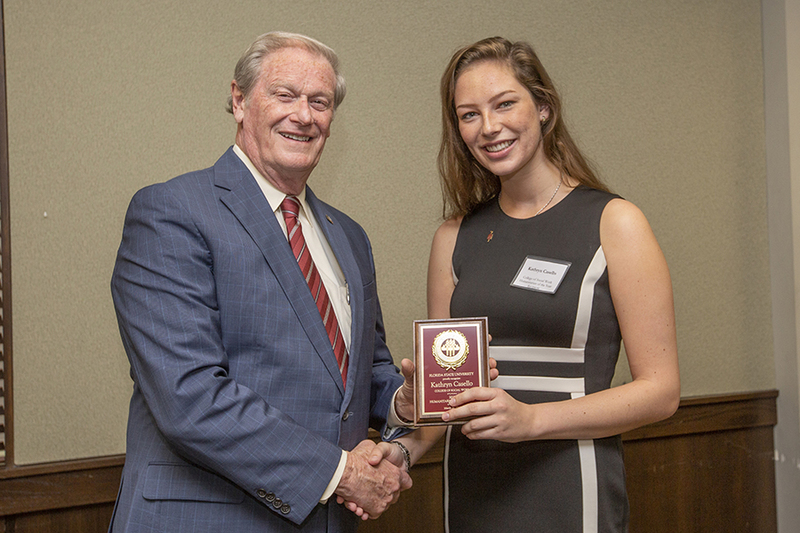 To her, this award illustrates not just the nominees’ commitment to service, but also FSU’s. Kathryn Casello was nominated by the College of Social Work. When she isn’t teaching suicide prevention classes or helping middle schoolers at the Oasis Center for Women and Girls, she’s fighting for the Campaign to Keep Guns Off Campus. 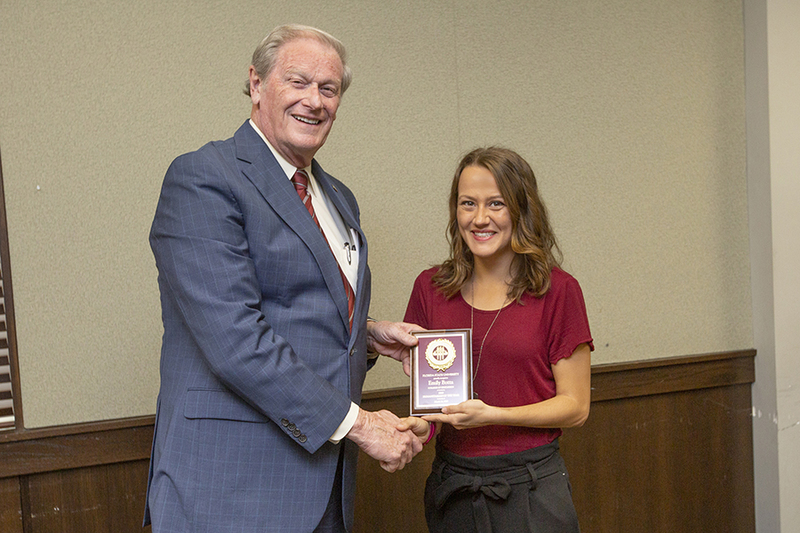 She expressed her thankfulness for FSU’s support at the luncheon. Whether it’s helping African refugee students learn English, building relationships with students with disabilities, being a Dance Marathon morale captain or advocating for arts education, each nominee for the 2019 Humanitarian of the Year Award has already made a positive impact on the world. The Humanitarian of the Year Award will be presented at the Leadership Awards Night at 5:30 p.m. Tuesday, April 9. Botta is a senior majoring in English education. 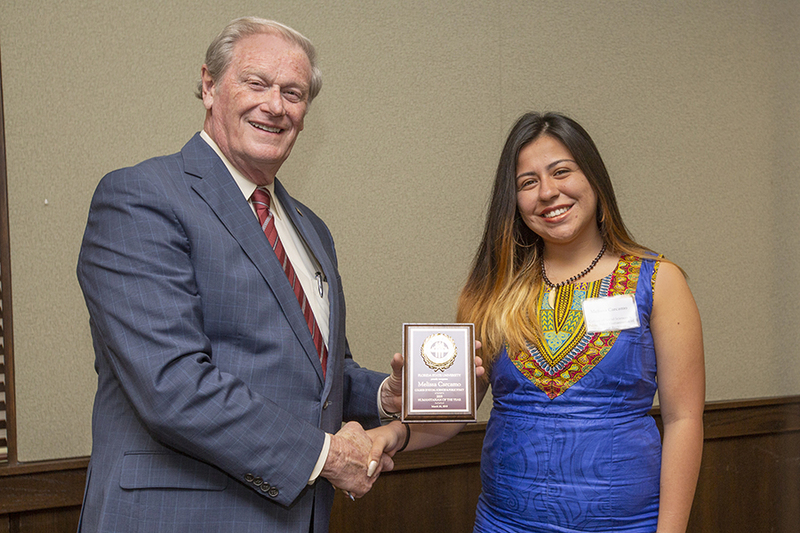 She has served with the Leon High School English Language Learner Program, which helps African refugee students refine their reading, writing and conversation skills. 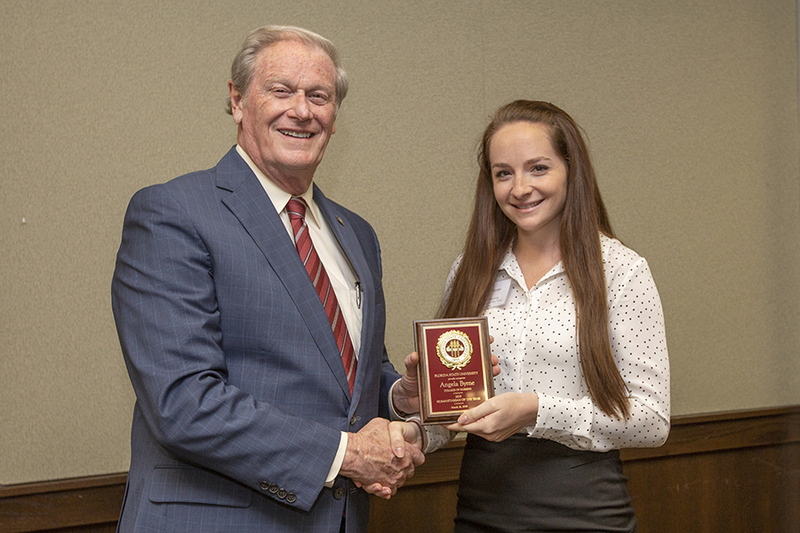 Botta also facilitated a collaboration between Alpha Phi Omega and FSU Food Recovery Network to collect food from the Figg Athletic Dining Hall and redistribute it to communities experiencing food insecurity in Tallahassee. She also regularly volunteers with the Ronald McDonald House preparing meals for families whose children are in the hospital. Craig is a senior double majoring in criminology and statistics. She has regularly volunteered with Big Bend Hospice, helping to provide companionship and support to patients and their families while they are in hospice care. Craig has also volunteered with a first-grade class at Hartsfield Elementary School, leading small-group activities to provide extra aid to students who may have learning disabilities. On campus, Craig serves as the vice president of RENEW (Recognizing Everyone’s Need for Emotional Wellness), working to promote emotional wellness among the student body. Steinberg is a junior majoring in family and child sciences. She serves as the public relations vice president for Best Buddies, promoting campaigns such as the “Friendship Walk” and “End the R Word” while also building personal relationships with students with disabilities. In addition, Steinberg was the Dance Marathon morale captain, supporting other dancers while personally raising over $1,000 for Children’s Miracle Network. She also works as a research assistant in special education at FSU. Byre is a junior majoring in nursing. She recently participated in a MEDLIFE service-learning trip to Riobamba, Ecuador, assisting local healthcare professionals in providing care and education to communities with low healthcare access. Byrne regularly returns to her hometown, Crystal River, to participate in programs packaging meals for hungry communities, providing activities for individuals with disabilities, and Christmas shopping with underprivileged children. She also tutors and reads to children at HOPE Community, a homeless shelter serving children and families. Harmon is a senior majoring in music education. She has volunteered with COCA (Council on Culture and Arts), creating cross-discipline lesson plans surrounding outdoor public art in Tallahassee and mentoring middle school students in art education. Harmon has served as a classroom assistant in numerous Leon County Schools assisting in music classrooms. She is also a state board member of the National Association for Music Education and actively advocates for arts education for all Florida students through meetings with legislators and a campaign video shared nationwide. Duncan is a junior double majoring in psychology and criminology. She volunteers as a crisis counselor and shift supervisor at 2-1-1 Big Bend, a major crisis counseling hotline, providing counseling to callers facing various issues and supervising counselors in training in their work. Duncan also participates in Sisters2Service, an organization that mentors young women at the Walker Ford Community Center. 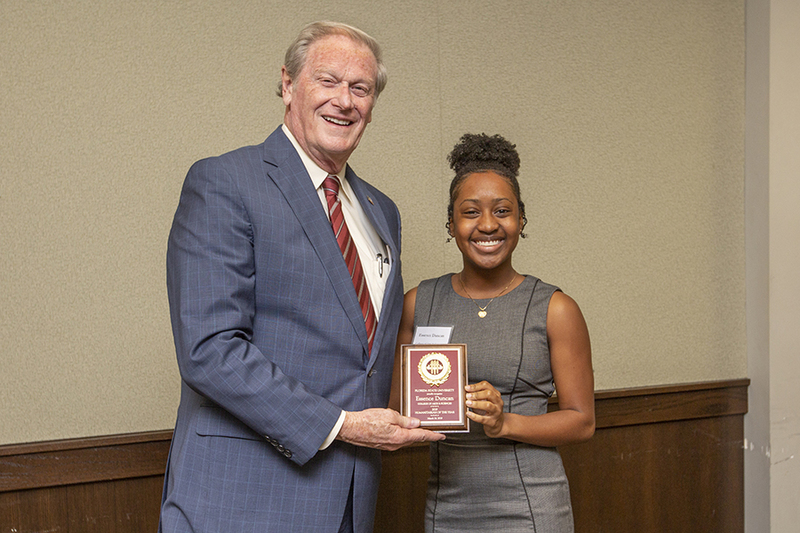 In addition, she serves as a peer navigator through FSU New Student and Family Programs, mentoring first year students through their transition from high school to college. Magi is a sophomore majoring in environmental engineering. She founded the FSU chapter of Gift of Life Bone Marrow Registry, a national organization that encourages people to register as bone marrow donors to support the fight against leukemia, lymphoma and other cancers. Magi is also a recruitment captain for Dance Marathon to raise money for Children’s Miracle Network and helped start the InspiratioNOLE leaders group for unaffiliated dancers to join. She also serves with Sustainable Campus as a residence hall representative and general volunteer. Calleson is a junior majoring in community patient care. She spent the summer of 2018 serving with Maison de la Gare, a center in Senegal for impoverished and victimized children, where she helped nurses provide first aid to children and did community outreach teaching hygiene and English. In addition, Calleson recently participated in a service trip with MEDLIFE providing dental care, general check-ups and free prescription medications to rural communities. She also offers companionship to and organizes tutoring for children at HOPE House, a safe shelter for families and children. Grice is a senior majoring in marketing. Over the summer of 2018, she served as a filmmaker with New Mission Systems International, filming nonprofit workers in Uganda, Rwanda, and Malawi to give a platform to people who are doing amazing work in Africa and benefit their missions. Grice also was a mentor to a young girl named Kaylin for two years through Big Brothers Big Sisters. She currently mentors a young boy named Keyshaun through the HOPE program, meeting weekly to help with homework, play, fellowship, and enjoy a meal together. Castelli is a senior majoring in recreation, tourism, & events. She has worked for four years as a volunteer youth volleyball coach at the local YMCA. Last year, Castelli served as a buddy for the Tim Tebow Night to Shine event, accompanying a young man with special needs to a prom geared toward making all participants feel special. 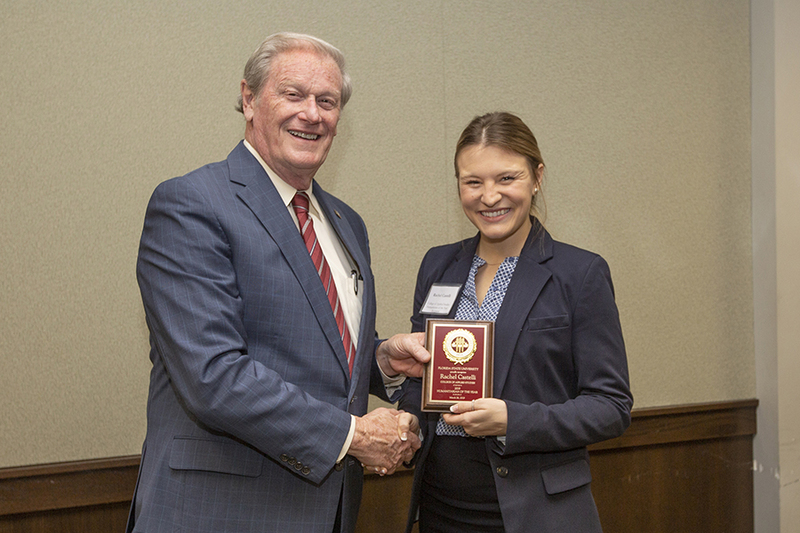 Through her sorority, Castelli has participated in multiple fundraisers for St. Jude Children’s Research Hospital, leading to an interest in and subsequent internship with the organization. Her internship has helped her realize the impact of fundraising and other activities to the families of seriously ill children. McShaffrey is a senior majoring in public relations. She worked as an intern with The Moore Agency, contributing to their education campaign and the ratification of Amendment 10, ensuring Floridians’ right to vote for several local offices in elections. In addition, McShaffrey served as the marathon events captain for Dance Marathon, assisting with event planning and personally fundraising over $1,500. 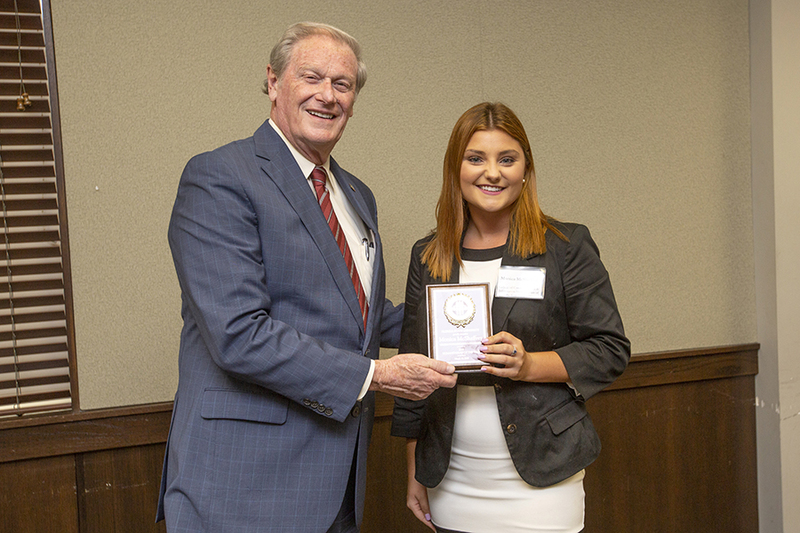 She has also been vice president of new member education and a Panhellenic delegate for the Alpha Sigma Chapter of Delta Zeta Sorority, advocating for women’s empowerment within that role. Carcamo is a junior majoring in interdisciplinary social sciences. Over summer 2017, she served with the Himalayan Media Welfare society presenting in classrooms at low-to-no income schools in rural India about serious issues the students might face and how to avoid them. The next summer, Carcamo taught gender-based violence prevention courses to adolescent males in rural Kenya through the Fountain Youth Initiative. 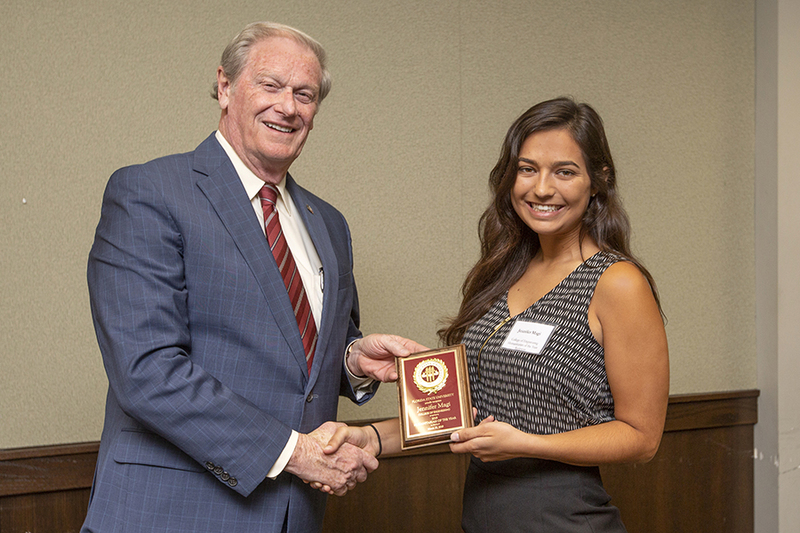 She also serves as Community Relations Chair for FSU’s Hispanic/Latino Student Union, connecting Hispanic/Latino students to social and professional development opportunities. Wishart is a senior majoring in studio art. She spent a summer at Parijat Academy in India as an art teaching intern, creating art curriculum and a mural project for seventh grade students to create long-term public art. She also participated in a weeklong service trip to Woodland Harvest Mountain Farm, assisting an organization practicing completely sustainable living. In addition, Wishart is a Bear Management Unit intern at the Florida Fish and Wildlife Conservation Commission, where she creates data-based maps for field biologists and conducts outreach events to educate the public about bear management. Casello is a senior double majoring in social work and political science. She spent a semester facilitating educational empowerment and leadership sessions with middle school girls at Oasis Center for Women and Girls. Casello co-founded You Are Not Alone, a youth suicide prevention program that provides training sessions in prevention techniques and lobbies to raise awareness for mental health. In addition, she is a field organizer and FSU chapter president for The Campaign to Keep Guns Off Campus and both organized and led the February 2018 Florida March for Gun Control.